Marcel Wanders' 1996 Knotted Chair, which marked the Dutch designer's international breakthrough, is the next iconic seat design in our A-Zdvent calendar for this year. 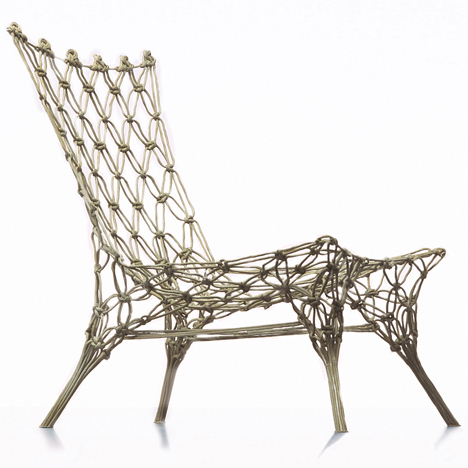 Marcel Wanders, now one of the world's best-known designers, created the seat by knotting lengths of synthetic rope around a carbon frame and coating the form in epoxy resin. Once woven and soaked in the resin, the chair was hung in a frame to allow gravity to dictate the final shape of the continuous seat and back. "One of the key principles in my work has always been the wish and the need for durability," Marcel Wanders told Dezeen when his exhibition at Amsterdam's Stedelijk Museum opened earlier this year. "Not only for ecological reasons, but also for getting the best out of a product so people will just want to have it forever." He designed the piece while working with Dutch collective Droog and presented it as part of the group's 1996 Dry Tech I project – its fourth exhibition in Milan – which received a huge number of visitors. "On the opening day enormous crowds gathered and the police had to be called in to control the traffic outside the building," said Droog's website. Droog collaborated with the Aviation and Space Laboratory at Delft University of Technology on Dry Tech to develop designs using high-tech materials. At the time, aramid and carbon fibres were not commonly available to product designers. Wanders' braided these to create a macramé-like pattern that evokes Droog's handcrafted aesthetic. Italian furniture brand Cappellini manufactured 1000 editions of the Knotted Chair before it ceased production of the design in 2011. The chair is listed in the permanent collections of a number of prominent design museums, including the Stedelijk, the Museum of Modern Art in New York and the V&A museum in London. After receiving global attention for the Knotted Chair, Wanders went on to co-found design label Moooi in 2001, and work on products and interiors within his own studio Powerhouse.